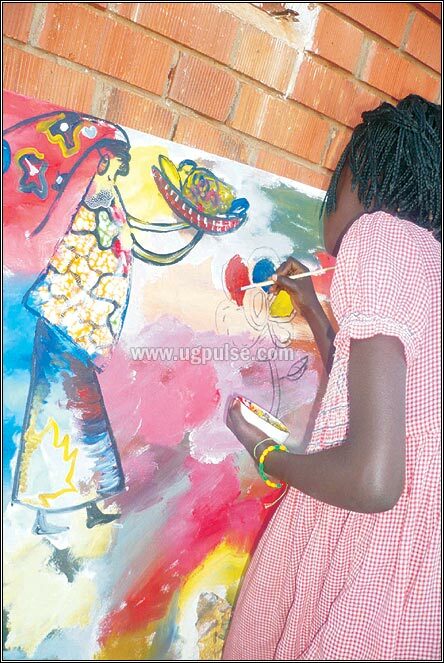 In August, Uganda Art Consortium held a three day art workshop at Kisa Primary School in Nansana, Uganda. Children from the school and the surrounding neighborhood had the opportunity to learn drawing, oil painting, beadwork jewelry and other art skills. Leaders of the workshop were UAC members James Nsamba and Farouk Mukwaya. Several of the paintings by the children were displayed and sold at the recent UNAA convention at National Harbor, Maryland. Dominating the display was a huge (5 ft x 3 ft) oil painting on campus that was designed and created by children in the workshop. At least 25 children worked on the painting during the workshop, adding vision and ideas. 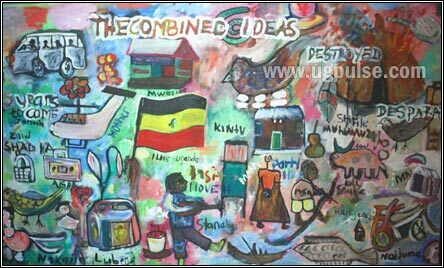 The painting is called “Combined Ideas” reflecting the mixture of children who created the artwork. Several smaller canvases by individual child artists were also on display. One of the girls works her ideas into “Combined Ideas”. A child paints on a large canvas in the Kisa school yard, while others draw some of their ideas on paper. The consortium is also holding a series of workshops at Mulago Hospital in Kampala for patients in the infectious diseases institute. 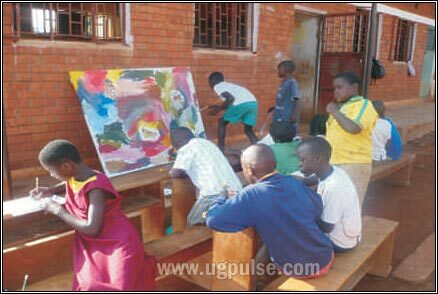 The Uganda Art Consortium sponsors art workshops for orphans and poor children in Uganda, and holds art therapy sessions for HIV-AIDS patients, and other victims of disease and misfortune. Uganda Art Consortium is a project of Kisa Foundation USA. Please visit our website at http://ugandart.com. My designs are very different from what the Ugandan market offers. My fashions are authentically African.